Want to shop where the Romans shop? The area of shopping near Spanish steps is the place to be. It's not only a great spot to not only do some shopping for yourself, but also to "do as the Romans do", and get in some great people watching while you are at it. When there are sales﻿ - this is on my Rome Shopping Guide page. This map shows most of the places I talk about on this page. You can select to view them all, or just the main shopping streets, or just the quiet streets, or, just the places I suggest for a nice break! If you are taking the metro, get the red line A to Spagna. When you come out of the metro stop, you will be standing right at the base of the Spanish Steps in Piazza di Spagna, with shops all around you, and streets branching out in front of you, and to the left and right as well. You are in shopping central! The bottom of the Spanish Steps and the beginning of Shopping Central! You may also get out of the metro at the Flaminia stop, which will put you closer to Piazza del Popolo, and you can work your way towards the Spanish Steps from there, coming up via del Babuino, which happens to be "twinned" with New York's Madison Avenue, and is about as swanky. Metro to Barberini - start your shopping with a view from the top! If you get out of the metro at Barberini, you can walk straight from Piazza Barberini to the right, on via Sistina, to the top of the Spanish Steps, where the Trinità dei Monti church is. Via Sistina is not really the best street for shopping near Spanish Steps but there are a few shops along the way. The main goal for coming in this way is the view from the top. There are a few main streets for shopping near Spanish Steps, where the high-end brands are concentrated, but each has its own character. Let's start with the poshest street of them all, via Condotti. Via Condotti is the street that continues from the bottom of the Scalinata di Trinità dei Monti, or Spanish Steps. If you stand in the middle of via Condotti, you will have the Spanish Steps and the church at the top right in your centre view. Via Condotti may be compared to the most elegant shopping streets in other big cities, such as the Champs-Elysée in Paris, Bond Street in London or Fifth Avenue in New York. It is the most prestigious shopping street in Rome. This is where the top brands, called griffes in Italian lingo, may be found: Hermès, Bulgari, Gucci, Prada, La Perla, Jimmy Choo and much more. I will say that for me personally, it's not my favorite street for shopping near Spanish Steps: it's wide, paved and usually very crowded and doesn't give me a sense of charming Rome. But it is really lovely at Christmastime, with the holiday lights and shop windows glowing, and all the elegantly dressed Italians strolling arm in arm, window shopping and generally doing their holiday thing. The two streets on either side of via Condotti, via Borgognona to the left if you are standing in the Piazza di Spagna, and via delle Carrozze to the right, are also full of very high-end brands, and often those brands better known in Italy than out, such as Ermenegildo Zegna, Bruno Cucinelli, Emilio Pucci, Roberto Cavalli, Malo, and more. Ah, one of my fave streets for shopping near Spanish Steps. Via Frattina is to the left of via Borgognona if you are standing in Piazza di Spagna. This is a wonderful street for the mix of shops on it. Via Frattina, a nice mix of cheap and expensive shops, something for everyone! The first bar/café on your right (and so far the only bar on this street), Bar Frattina, has very good coffee, and superb, and I do mean superb, rich, dark chocolate gelato. Oh and the walnut gelato is fabulous also. It's actually a little neighbourhood bar, and often full of locals. Get your receipt ("scontrino") first, and then go to the counter to order. Avoid sitting outside where you will pay a lot more for whatever you get. Andrea Fabiani - really cheap shoes! Some are even Made in Italy! They have a huge selection and really really low prices. It's a bit chaotic in there at times, but can be worth it. Well, you do get what you pay for...you are not getting Tod's quality shoes for these prices, but my mom got a pair of sandals there once and they lasted a couple of summers. Fausto Santini - well now we are in the opposite of the store above. Fausto Santini is one of the great Roman fashion houses and they make simply gorgeous bags and shoes. I have many of each and can attest to their quality. The shoes fit like gloves and the bags are comfortable to wear on your shoulder and cleverly made so they are not just beautiful but also practical too. I always get compliments every time I carry one of their bags. Fausto Santini - a true Roman fashion icon; you've never had shoes and bags like this! SHOPPING OUTLET SECRET! - Check out the very under-advertised Fausto Santini outlet on via Cavour 103 (near Santa Maria Maggiore), where you will find a wonderful selection of last-season's items for quite a savings. The outlet is run by Fausto Santini's father, Giacomo Santini. Venchi chocolates - Oh my. Gelato! Chocolates! Bonbons! Oh my! Vertecchi paper shop - a classic and everyone's go-to shop for elegant writing supplies, wrapping supplies, artist's supplies and especially Christmas decorations. This street leads from via del Tritone in towards the Spanish Steps. It's a pretty long street and there is not a great selection of shops. However, one of my go-to clothes/shoes shops in Rome is here: Victory. It's kind of like a Top Shop or Intermix, where there are many different brands to mix and match, from medium to high end. All the clothes are arranged by color, which makes it a bit odd for browsing but the best thing is that the saleswomen are very helpful in giving you suggestions for what you might be looking for. They have fantastic shoes and other accessories as well. And, there is a men's Victory store on the opposite side of the street. via due Macelli 103. Via del Corso runs all the way from Piazza del Popolo to Piazza Venezia. It's a very long street with shop after shop after shop. Think of this as something like Sunday at the mall with teenagers. You will find Sephora, Nike, Disney, The Gap, Footlocker...ok there are also some more local brands but none that are special. Regardless of its (to me) lack of charm, it is always packed with people, especially Italians, strolling and window-shopping, especially on holidays when everything is closed. Have you seen the movie Roman Holiday, with Audrey Hepburn and Gregory Peck? Then you know the main reason I love this street: via Margutta is where Gregory Peck's character had his apartment in that movie. Swoon! Either way, don't miss taking a lovely stroll down this very quiet and sweet street, one of my favourite in Rome. It's more of an artists' street, with art galleries, antique shops and other strange and wonderful boutiques. 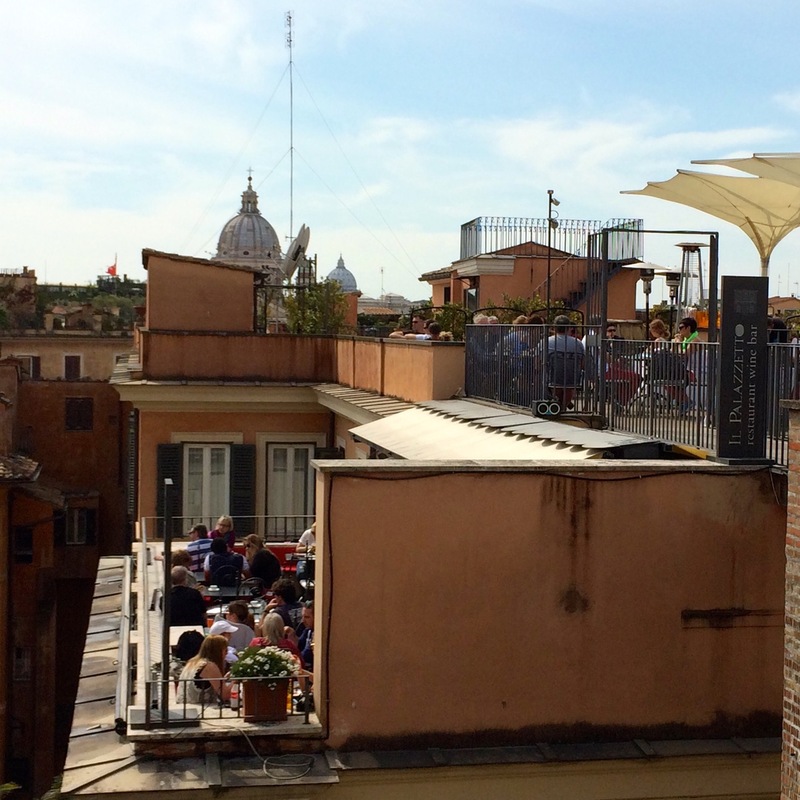 It's less about shopping near Spanish Steps than it is enjoying a quiet, hidden part of Rome. In the warmer weather, the street is covered in wisteria and other flowering vines. Via Margutta is an oasis of calm in the hustle and bustle of Rome's shopping zone. Via Vittoria is one street over from via della Croce. Despite its proximity to the Spanish Steps, it is always a quiet street but no less of a shopping street than others in this area. Via Vittoria has wonderful boutiques in various price ranges. Piazza san Lorenzo in Lucina is not so much a quiet street as a little plaza. Despite its location at the foot of via Frattina, crossing over the via del Corso, I think of it as relatively quiet for this area. There are 3 cafés (two of which I love); a sweet little church (the actual san Lorenzo in Lucina) where local residents attend, and sometimes get married; and a pretty wide, car-free plaza where sometimes local kids play ball. If you want swanky shopping near Spanish Steps, don't miss this piazza. The Louis Vuitton flagship store is here, housed in an old theater and taking up two stories. It's gorgeous to behold even from the outside. The interior of the Louis Vuitton shop in Rome. Don't be afraid to go in and just look around. They encourage it and nobody minds. Enjoy! Head up the stairs of the Louis Vuitton shop, take a comfy reclining seat in the cinema room, and catch some vintage 60's Italian movie stars in action! An enormous Bottega Veneta shop takes up one corner of the piazza (right next to the carabinieri.) Recently, Christian Louboutin opened a boutique on this piazza, and Brooks Brothers is the latest chic shop to open here. This plaza is the beginning of the Campo Marzo area, which leads to the Pantheon. 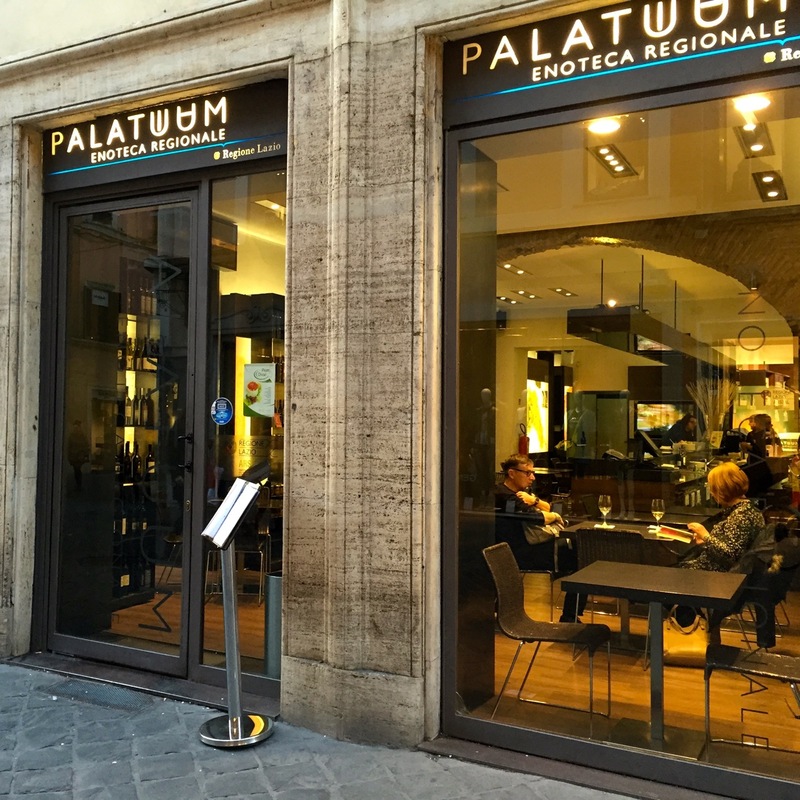 Click here to read more about shopping near the Rome Pantheon. 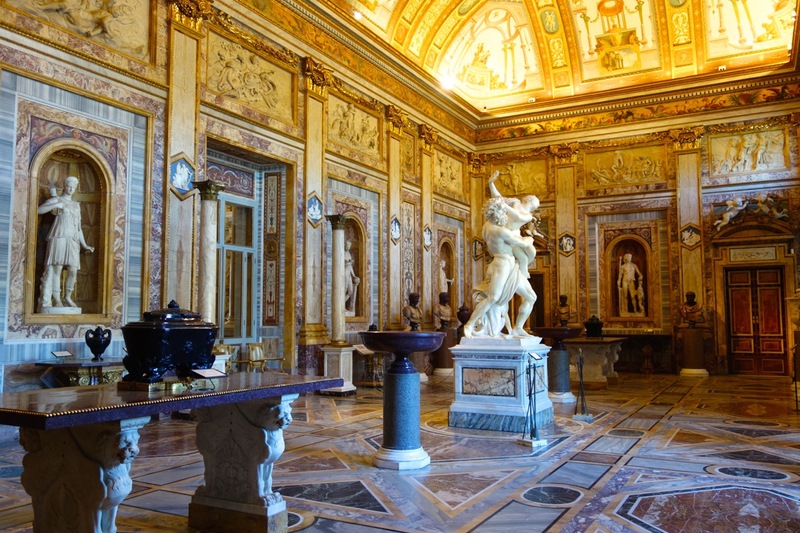 As I wrote on my Rome Shopping Guide page, traditional shop hours are usually from about 9:30 or 10 am until 7:30 or 8pm, with a 2-3 hour "lunch" break in between. Also, traditionally, shops are closed Saturday afternoons, all day Sunday and on Monday mornings. Remember, you cannot sit and eat or drink on the actual Spanish Steps. But you can sit there if you want. It's just very crowded. 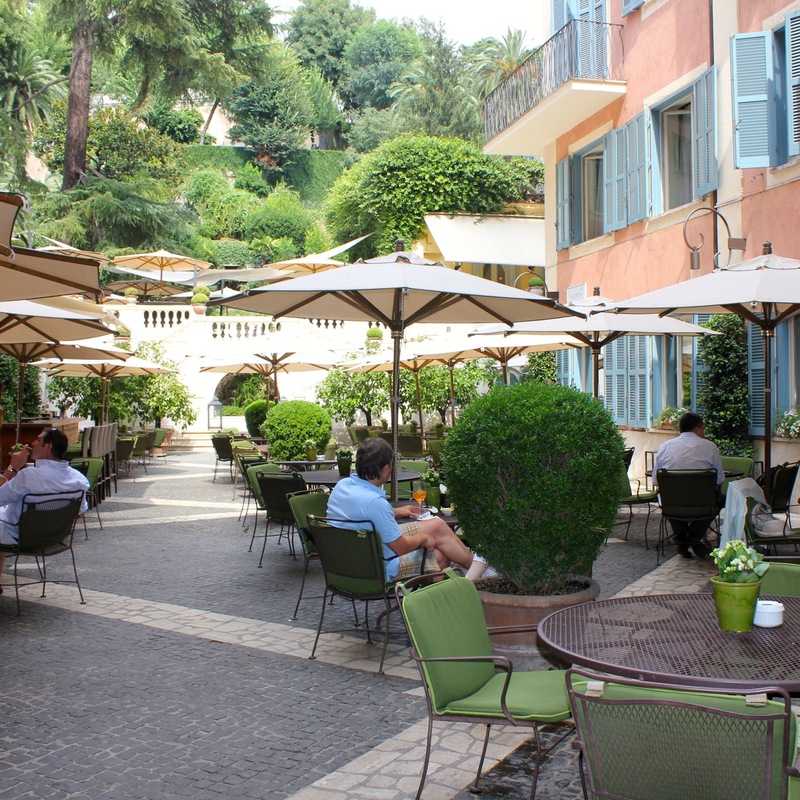 this is the poshest place you could rest while shopping near Spanish Steps, but it's a real treat, especially when you can sit outside in the garden. A coffee will cost around 5-8 Euros, but they will bring you cute little biscuits. A glass of wine will set you back 15 Euros, and a martini, 20, but you'll get all kinds of snacks. For a splurge, this is the best. Via del Babuino at the end near Piazza del Popolo. Particularly cozy in cooler weather, Caffe Greco is an historic café, right on via Condotti. Expect to spend about 10 Euros for tea or coffee, but your cute waiter with the long tails will bring you some snacks to go with. The view just does not get better than this, at least while shopping near Spanish Steps. At the top of the Spanish Steps, you can sit under umbrellas and have a nice aperitif, gazing over the plaza and all the shoppers buzzing around the Spanish Steps below you. A very Roman hangout in piazza San Lorenzo in Lucina. They have tables outside, even heat lamps in cold weather, so you can always do a little people watching while you rest. They serve food here too, but go for the ambiance and the sitting. I love this enoteca on via Frattina. They only serve wines from the Lazio region. But that's not why I love it. It's great because it has plenty of tables, room at the bar and a nice little happy hour. Interesting, affordable wine right in the middle of all the major shopping. What more could you want? Either Rosati or Canova at Piazza del Popolo, some of the best people-watching in Rome. Both of these caffès are smack on Piazza del Popolo, and have lots of tables outside. 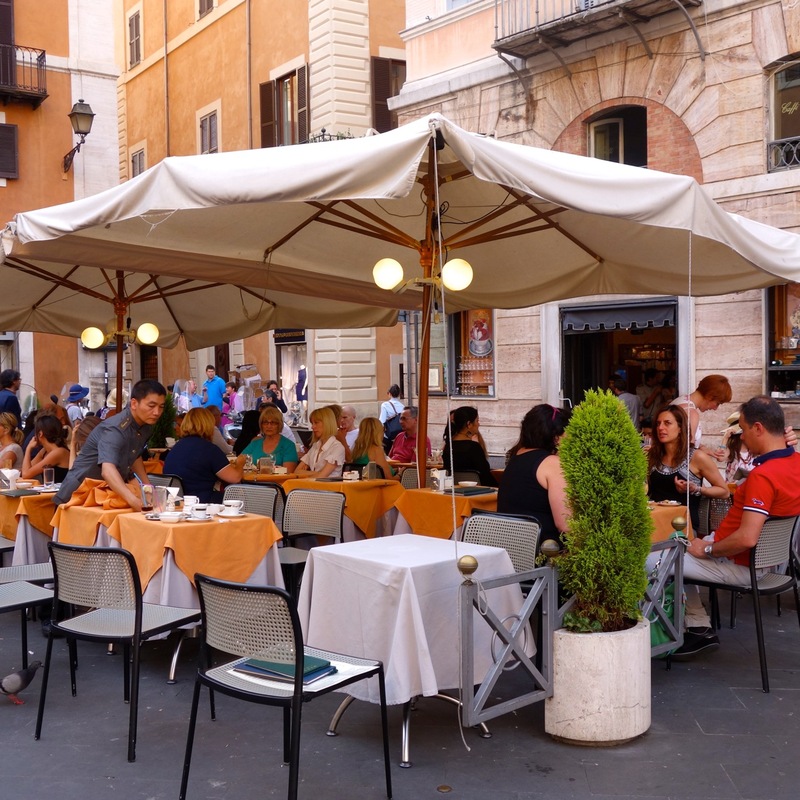 You can sit and linger over a coffee or beer as long as you want, and watch the shoppers, Romans and tourists alike as they flow in and out of the square and onto the shopping streets nearby. Return to the top of Shopping Near Spanish Steps.